Sebastian Vettel cut a frustrated figure at the United States Grand Prix despite recovering from an early mistake to finish fourth and keep Lewis Hamilton waiting for his fifth Formula One title. Vettel endured a day of mixed fortunes in Austin as he suffered an early collision with Daniel Ricciardo, but battled back to finish fourth. 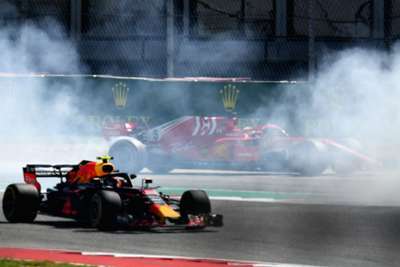 The incident with Ricciardo saw Vettel spun around the wrong way and dumped down to 15th place, but Ferrari's tactical plan enabled him to save face as team-mate Kimi Raikkonen claimed victory. And he finished on a high to get past Valtteri Bottas and ensure he still has a faint chance of denying Hamilton in the closing races. But there was not much of a smile on his face when he spoke to the media after the race, Vettel saying: "I have mixed emotions. "I'm really happy for Kimi, but I'm not happy with my race. "Tough weeks for the team and the tough times don't seem to be stopping for me. It should have been a better day." On his contact with Ricciardo the four-time world champion felt neither driver was at fault, something the stewards agreed with as no action was taken. "I must have been in his blind spot, he must not have seen me," added Vettel. "The corner was tightening and I couldn't really get out of it anymore and we made contact. "It's obviously a shame. It was a big loss for me to come back." Race winner Raikkonen was obviously delighted to take the chequered flag in one of his final outings for Ferrari, his victory ending a 111-race winless streak stretching back to 2013. "It's been a great weekend," said the Finn. "I had a good start and needed to push hard. "It was a battle a few times and, in the end, the tyres were not in the best shape - but I think it was similar for Max. "Lewis had more tyre left, but we kept it consistent. "It was a great battle. I think that's what we all want - both the drivers and the people here."